The first program initiated by The Hunger Task Force, the Kane Street Community Garden, was established in 1998 and produced about 500 pounds of vegetables. Since then, the Garden has grown in size to two city blocks and produces, on average, 30,000 pounds of fresh, organically-grown vegetables each year. The Garden, located on the corner of Kane and St. Cloud Streets on the North side of La Crosse, is situated land rented from the city of La Crosse. Under the direction of the garden staff, hundreds of volunteers assist with planting, weeding, and harvesting each season in order to distribute free vegetables to the community. The garden is a proud recipient of funding from the City of La Crosse through a Community Development Block Grant (CDBG). Every Monday, Thursday, and Saturday afternoon during the harvest season (beginning in May), volunteers assist with harvesting vegetables for distribution. Come to the garden on harvest days during the hours listed below, register as a volunteer, and wait for instruction from a garden staff member. After harvesting is completed, volunteers are allowed to be first in line for the distribution of vegetables, but anyone coming to the garden will receive produce. Please understand that harvest nights may be cancelled for inclement weather. Also, community members are asked to refrain from harvesting vegetables at any other time than regularly scheduled harvest nights. Garden tools (such as hoes, shovels, and a rototiller) in new or “like-new” condition. Thanks to George Fulford, (a.k.a. 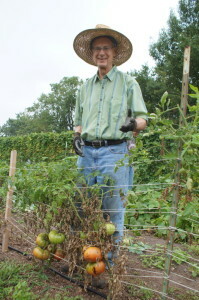 “The Tomato Guy”) who has volunteered hundreds of hours at the Kane Street Community Garden this summer overseeing the development of 400 tomato plants!